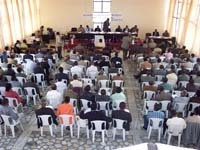 Evangelical Church Fellowship of Ethiopia has a long history of serving its members as an umbrella organization. Since its establishment in 1976, it has performed different activities. After reviewing current internal and external realities, ECFE developed this strategic direction document covering a period of 10 years, 2007-2016 through a comprehensive and participatory strategic review process. The Task Force established in 2006 took the responsibility of coordinating the process. It organized orientation on strategy development to all relevant stakeholders. The development of the road map for the review process was followed by a survey conducted to gather information and opinion with fair representation of all stakeholders. The strategic directions were agreed up on in a workshop organized in 2007, which lead to the preparation of this document. The vision of ECFE is to see “Churches United in Christ and Equipped in Fulfilling the Great Commission in Ethiopia and beyond”. Its mission is “Equip members to fulfill the goal of the Great Commission through capacity building, advocacy and peace building”. The core values that are up held during its operation are Unity, Holiness, Serving the Whole Person, Integrity and Transparency, Good Governance, Peace and Justice, Responsiveness and Servant hood.